Kyiv, 2 October 2018 – Following the UNDP/GEF call for municipal projects proposals in the heating sphere using agricultural biomass, 15 such projects will be provided with technical assistance, including consultancy in the process of technical documentation development, as well as the search for the most relevant project financial mechanisms. Overall, around 40 applications from 19 regions of Ukraine were submitted for the competition, which was conducted among municipal projects, focusing on the provision of heating supply using agricultural biomass. The submitted project proposals feature the construction of a new, or a reconstruction of existing boiler houses, and the installation of biofuel boilers using agricultural biomass (for instance, straw, corn stalks, sunflowers, energy crops). This is an effective alternative source of thermal energy, bringing significant economic benefits and allowing municipalities to save both fuel and energy resources. The highest number of applications was received from the city of Uman, Cherkasy region, while the city of Bakhmut in Donetsk region submitted the projects with the highest capacity. The competition results were announced on September 26th, 2018 during the workshop of the UNDP project "Development and Commercialization of Bioenergy Technologies in the Municipal Sector in Ukraine". At the event, around 30 representatives of municipalities from Cherkasy, Donetsk, Vinnytsya, Chernihiv, Zhytomyr, Zakarpattia, Sumy, amongst other regions of Ukraine, who applied for the call for project proposals, learnt more about the specificities of the technical assistance to be provided for the selected projects, along with the financial opportunities available. In addition, participants received individual consultations from UNDP project experts and bank representatives on the effectiveness of implementing bioenergy projects. The seminar also created a platform for municipalities, commercial banks and technical experts to accelerate and simplify the implementation of heat supply projects using agrarian biomass. "In Ukraine, the practice of bioenergy project implementation, using wood as fuel, is widespread. 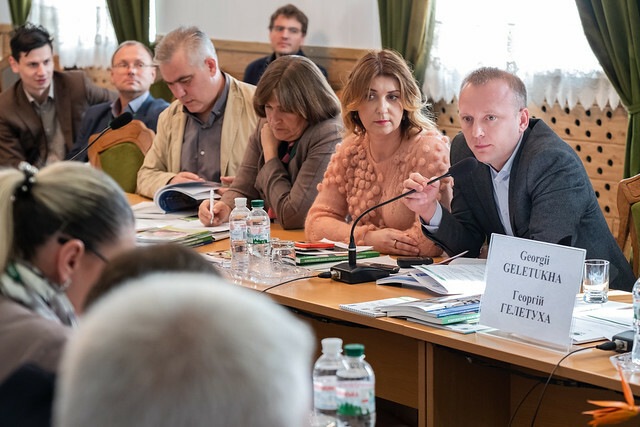 But, considering the potential of agricultural biomass, which is currently less popular than wood, we believe that there is a necessity to provide support to projects who plan to use agricultural biomass, and contribute to the development of this area in Ukraine," said UNDP/GEF project manager Yevhen Groza. From July 7th to August 10th 2018, UNDP called for municipalities to submit heating project proposals, using agricultural biomass to provide heating needs, for the provision of technical assistance from the UNDP/GEF project "Development and Commercialization of Bioenergy Technologies in the Municipal Sector in Ukraine", implemented with the support of the Global Environment Facility. The call allowed municipalities, communal institutions (schools, hospitals, kindergartens, etc.) requiring heat supply, as well as private commercial entities providing heat energy to municipalities or district heating systems, from all over Ukraine to take part in the competition. The implementation of selected projects is scheduled for October 2018.